Notre location de vacances de luxe villa est située dans un beau prestigieuse communauté, station fermée, le Club Cortile, qui est à quelques minutes de Disney, Universal Studios et Sea World; distance de marche de grands magasins, très restaurants et navette publique nominale. Cette villa entièrement équipée comprend 4 chambres, 3 salles de bains complètes, une télévision par câble, une connexion Wi-Fi gratuite, la climatisation, des ustensiles de cuisine, une batterie de cuisine, un four micro-ondes, un lave-vaisselle, un four et plus. Ce pittoresque vue sur le lac maison de vacances est un seul bâtiment de la maison de club, qui comprend une piscine chauffée, un bain à remous, aire de jeux, centre de fitness, une salle informatique, salle de cinéma, des courts de tennis et de basket-ball, etc. Vous trouverez des chambres qui sont similaires aux deux hôtels haut de gamme et de votre propre maison. Ce serait le type exact de maison de vacances que vous recherchez. Les serviettes, sèche-cheveux et un rouleau de tissu sont fournis dans chaque salle de bains. Great space and perfect location to the parks and restaurants. Very minor issues were resolved with in a few hours. Would highly recommend!!!! Our stay was great. The owner was very responsive and house was very clean. I would highly recommend to stay at this place. As per me It's far better then staying in a hotel. The property has all the facilities as stated in advertisement and area is very nice and quite. We will come back! Hi! Stacy. Yes, we liked the stay. The property was excellent, clean, everything was just fine. Also, the service provided by your local housekeeper was exceptional. She answered all questions or doubts we have and responded quick when we called her. Please express our gratitude to her. Once again, thanks a lot for the opportunity to stay at Circle Club Cortile. We have your information for future reference in case we planned another vacation at Disney. Thanks. Two weeks in a fabulous villa. We expended two weeks in the Kissimmee area at Orlando. The condo is located in a quiet zone with access control and close to all attractions. It easily accommodate 10 guest without problem with 2 master bedroom. Also, the contacted personal is always available to answer any questions or to provide support. I wll definitely recommends this property for vacations. 1) The booking was quick and seamless. The owner did have 24 hours to approve my reservation but did so within 2-3 years, and I got a text confirming the reservation. He also returned my security deposit the same day as checkout. 2) Depending on what you're looking for, it is reasonably close to some of the them parks and around the corner from a Super Target, which is very convenient. 1) My biggest problem was that the townhouse was definitely NOT clean. Far from it. Spider webs on the ceilings. Dried toothpaste on the hairdryer. Kitchen cabinets had a layer of grime in them. Marks all over the walls and blinds that could've easily been wiped away. Mold in the showers. Ring around the bathtub. Hair and dust bunnies in every crack and crevice. I'm sure the sheets and towels were probably clean, but overall, it was just grimy and didn't appear to have been cleaned well in months. We were only staying for one night, or honestly, I would've moved elsewhere. 2) To Clarify - the picture on the listing is NOT the townhouse. It's the clubhouse, and it's a flattering picture at that. 3) It's a very, very basic condo. I slept in the downstairs bedroom, and I felt every spring in the very flimsy bed. The king bed seemed nicer. A baby crib was provided, but it was a very old school elevated mini crib that I would guess no longer meets the codes for crib slats, etc - though I'm not an expert on that. It had a mattress that was significantly less than 1" thick. A high chair was provided, which was nice. The carpet was worn and frayed at some edges. Several light bulbs were blown. The living room had a decent TV and decent cable. I emailed my concerns to the owner after our departure (we were there ~18 hours, and I really didn't have time to deal with it in that time frame) and he responded with a simple, "I'll talk to the housekeeper," but this is clearly a longstanding problem. I would definitely not stay here again. 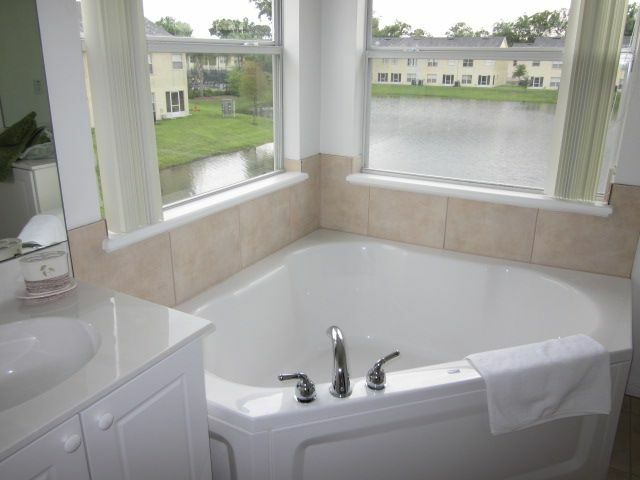 It is cheap, but you can find nicer, closer, cleaner places in Orlando in the same price range. Right as it should be. I was expecting something bigger when I saw the pictures but it was OK for us. Also the cover picture for this building in website is actually the front of club building, not the one you will go in, so do not suprise when you get there. Nice and beatiful place and as clean as what expected to be. Not so fancy but very good. Yes the first picture is the club house. Cette propriété est située à 5 miles de Disney, distance de marche de la rue d'affaires (HWY 192) où les grands magasins, les restaurants et les transports locaux peuvent être trouvés. Super Target, Publix et Wal Mart sont tous à proximité. The deposit will be transferred to damage deposit upon check in; This community allows NO pets, NO commercial vehicle, NO trailer and NO drug; NO SMOKING policy inside the house; Owner shall not be liable for any loss or damage to personal property belonging to renters. Liability for Personal Injury: Owner shall not be liable for any personal injuries sustained by the renters.